Champagne Fountain will add something royal and spectacular to your party. Consider this elegant “Pontrelli” champagne fountain when looking to add the wow factor to your event. Watch the champagne cascade endlessly all night with your friends and family. What a symbolic way to ring in any New Year or union of marriage. Champagne fountains can be used to serve other beverages as well such as: juice, punch, lemonade and sparkling drinks. The sound of the fountain along with the soft lighting is soothing and alluring and creates a lovely atmosphere around your bar and food service area. 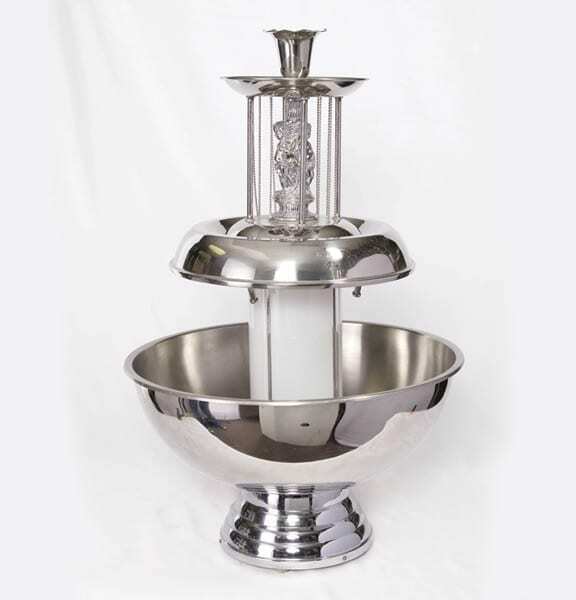 The fountain is fun to use and adds an entertaining center piece to your decor and food service. Do it, you deserve it! *We rent champagne glasses and other glassware.